Batu Cave and Petronas Towers have been on my Malaysia must see list since I first started traveling years ago. 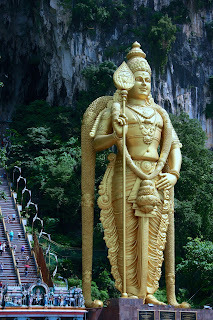 I've been looking forward to climbing the steps and seeing the statue of Murugan from above. Well, we finally got to experience Batu Caves and pictures don't do this place justice. It's amazing and BIG! Batu Cave is a Hindu shrine with several limestone caves and cave temples. The statue of Murugan, a Hindu deity, is enormous at 140 ft high. It is very easy to get to. 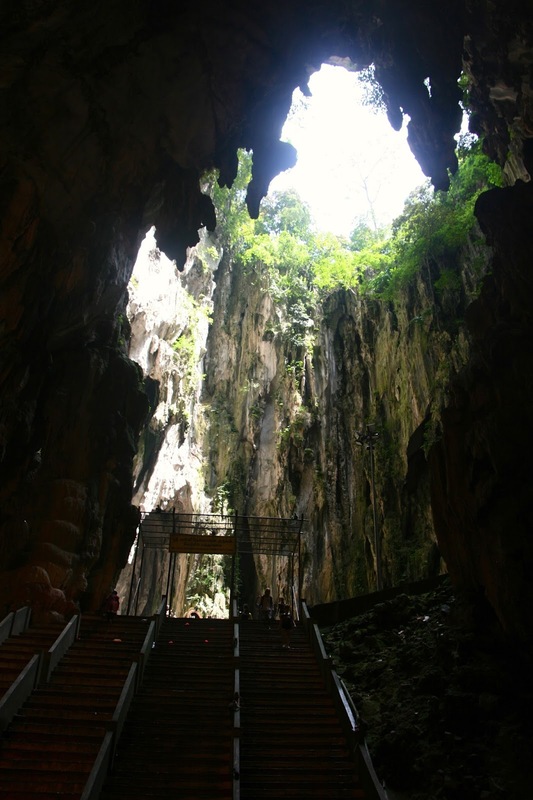 Just hop on a commuter train from KL Sentral and 30 minutes later your last stop is Batu Cave. Hiking the steps depends on your fitness level but if the 80 year old woman that lapped me can do it I think anyone can! As the train neared the station we could see the statue peering through the trees. It is beautiful and massive. After a 5 minute walk in the very hot sun (bring an umbrella) we began our hike up the steps. The kids practically few up the steps. There are several stopping points where we could take a breather and photos and laugh at the crazy monkeys trying to steal things from people. At the top we got to explore the cave a bit. Vendors line the entrance, of course, but once inside there are several shrines, roosters and more aggressive monkeys. After exploring a bit and people watching we got the kids an ice cream before heading back down (maybe that's why they practically ran up the steps). The view from the top is impressive. At the bottoms the kids got to feed the pigeons and we tried for the family photo. We had several people take our pictures and only one got the full statue in the frame. Why is it when you stand in front of a monument or something of importance and ask some stranger to take your picture they never get the full image of what you are standing in front of? Anyone else have that problem? Before we headed back to KL we had some excellent vegetarian food near the status. A must try if you go! It was a great morning and well worth the quick trip out there. I was very impressed! Anyone else been to Batu Caves?